Carlene Sawyer is a native of South Florida, whose family members are among Miami’s pioneers. While living in Chicago, Sawyer's work included the position Vice President of the Boys & Girls Clubs, where she directed human and financial resource development for various education and community organizations. Further, her special interest in Literacy led her to be a Public Library Trustee, the Board of Director for the Harold Washington Literary Award and the Printers Row Book Fair, and Co-Chair of the Authors Group at the Union League Club of Chicago. After 25 years of living and working in various parts of the United States and England, Sawyer returned to Florida to join the Dranoff International 2 Piano Foundation as Executive Director. Sawyer manages and oversees the funding, production and artistic integrity of Dranoff’s programs and the advancement of the Dranoff International 2 Piano Competition. 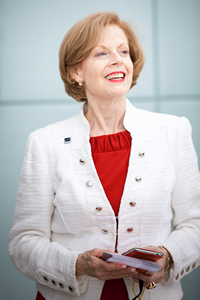 Under her leadership, the Foundation was awarded the State of Florida’s largest artistic subsidy - the Cultural Endowment Grant. The Dranoff has developed an annual concert season of Dranoff winners and has recently expanded its programming with a special emphasis on artist development in South America and Asia. She is also the creator and producer of Dranoff’s PIANO SLAM, the Foundation’s performance and education program, which has brought live music poetry and dance to over 60,000 teenage students in recent years. Sawyer’s community commitments include her work to support civil rights and education initiatives in Miami Dade County. A native of Boston, Martin Bookspan's early involvement with music came as a second violinist in the symphony orchestra of the Boston Music School Settlement. When he realized that his technical limitations would frustrate his wish to be the Heifetz of the next generation, he gently put his violin back into its case--where it has rested ever since. But he has lived a life in music. 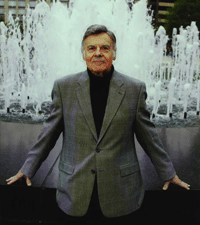 In a career spanning more than 60 years he has served, among other roles, as Music and Program Director of New York's WQXR; as Host and Commentator for broadcast concerts by the Boston Symphony Orchestra and the New York Philharmonic; as Commentator for 30 years for "Live From Lincoln Center"; as Narrator and Producer of documentaries on the lives of Jan Peerce, Claudio Arrau and other luminaries of the concert and opera stage; as Narrator in works for speaker and symphony orchestra with many of America's leading orchestras; and as Tape Critic and Columnist for The New York Times; as Consultant to the Rockefeller Foundation and a variety of programs of the NEA. He is the only broadcaster ever to be inducted into the Classical Music Hall of Fame in Cincinnati. He is the author of four books on music, including biographies of Zubin Mehta and Andre Previn. Pianist and conductor Maarten van Veen was a winner, along with his brother Jeroen van Veen, of the Dranoff International 2 Piano Competition in 1995. He studied at the conservatories of Utrecht, Prague and the Mozart Academy. He was early to specialize himself in the performance of contemporary music besides the classical repertoire. In 1998 he worked with Robert Craft on Stravinsky’s piano repertoire, and recorded” Les Noces” with the latter in the Abbey studios, London. The New York Times stated this recording as “the best recording ever [of the Stravinsky. 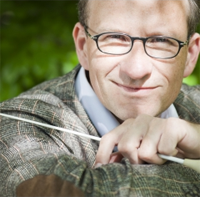 ]” Maarten has performed all over Europe and played with different orchestras and conductors, like Peter Eotvos, Howard Williams, Arie van Beek, Neal Stulberg and Robert Craft. He founded the International Piano Quartet (4 pianos) and played many concerts in the U.S.A. and Canada. In the Netherlands, Van Veen is member of the artistic board of the DoelenEnsemble and the Hortus Chamber, which offer programs with a panoramic view of the 20th and 21st centuries. Maarten van Veen is increasingly acclaimed as one of the most innovative and powerful musicians of today. Noted for the originality of his programming, critics have praised the intensity of interpretation as well the emotional impact he brings to the audience.